Sunday March 6th 1904 I was busy about the house all morning as I had neglected my work yesterday. I wrote letters in the afternoon. I talked with Mollie and read in the evening. weather warmed again. Monday March 7th 1904 I was busy all forenoon making a fruit cake and getting the dinner. I swept the lower story in the afternoon and was too tired to do anything but read in the evening. Will sold a cow to Ed Koser. 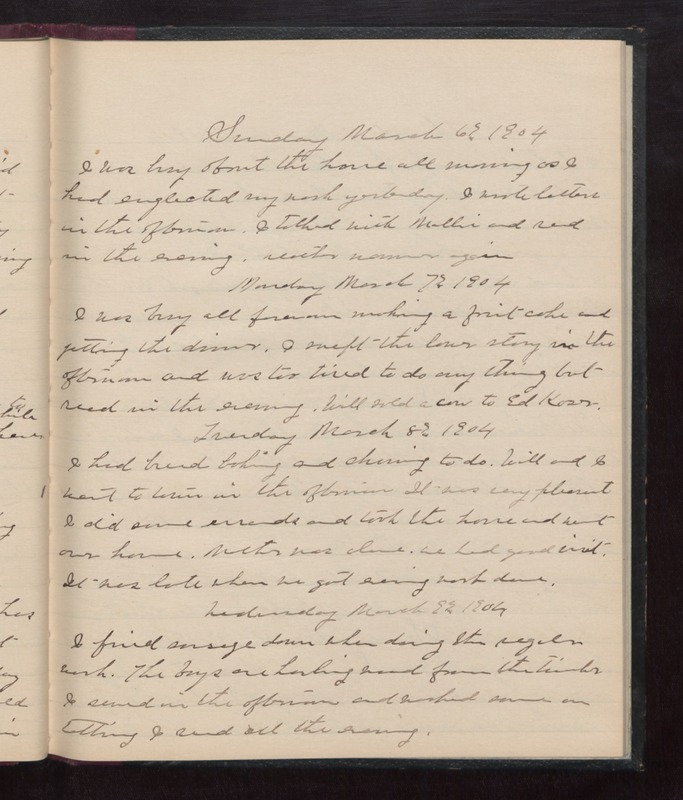 Tuesday March 8th 1904 I had bread baking and churning to do. Will and I went to town in the afternoon. It was very pleasant. I did some errands and took the horse and went over home. Mother was alone. We had good visit. It was late when we got evening work done. Wednesday March 9th 1904 I fried sausage down when doing the regular work. The boys are hauling wood from the timber. I sewed in the afternoon and worked some on tatting. I sewed all the evening.